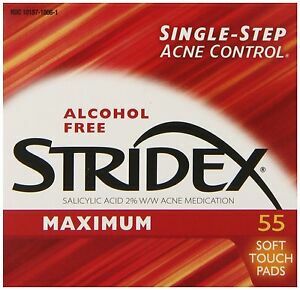 The Stridex Triple Action Acne Pads are an excellent alternative if you are looking for acne-free skin. The Stridex Acne and Blemish Control works by unclogging the pores and dissolving the oil that hides deep in the pores. Regular use of this Stridex skin care can lead to the elimination of existing pimples; regular usage can also prevent the breakouts from reappearing. Formulated with salicylic acid, ammonium lauryl sulfate, ammonium xylene-sulfonate, and citric acid, these Stridex Triple Action Acne Pads are helpful for exfoliation. The Stridex Acne and Blemish Control removes oil completely, kills bacteria, and leaves a fresh smell on the skin. Sofortige Zahlung von US $7,96 erforderlich.